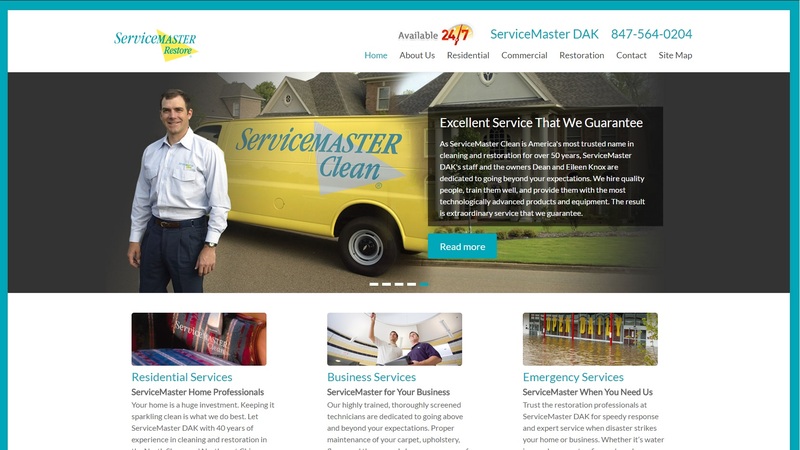 ServiceMaster DAK is one of the oldest, largest and most recognized of all the ServiceMaster Clean franchised businesses in the Chicago suburbs. It was established in 1975 by the two owners Dean and Eileen Knox, serving the North Shore and Northwest suburbs of the city of Chicago. Since then Dean and Eileen have expanded to 10 ServiceMaster Clean franchises in the North Shore and Northwest Suburbs. ServiceMaster DAK meets the stringent demands of the ServiceMaster Clean brand and is recognized as a leader in performance, service, and quality. The client has been with Proceed Innovative for 5 years, we designed their first website and lately redesigned the site to be responsive and mobile friendly.